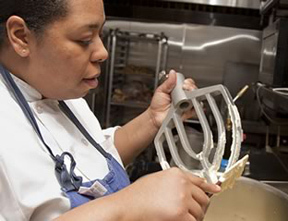 Executive Pastry Chef Taiesha Martin of The Supper Room at Glenmere Mansion, a luxurious 18-room and suite Relais & Chateaux Country House Hotel in Chester, New York, tempts the palate with her recipes for Coconut Tapioca Pudding, Pineapple Mojito Sorbet, Sautéed Vanilla Pineapple, and Candied Coconut. Located less than 50 miles from New York City, The Supper Room at Glenmere, is well worth the drive. I had the opportunity to experience Executive Pastry Chef Taiesha Martin's culinary vision during dinner at The Supper Room at Glenmere Mansion in late April 2011 and was impressed with her creative presentations and style that complemented the elegant, fine dining restaurant. She graduated from Johnson & Wales University in Providence, Rhode Island and honed her culinary craft working at such illustrious New York City restaurants as Michelin rated Fleur de Sel, Aureole, Tocqueville, and David Burke Townhouse (formerly David Burke & Donatella), before joining Glenmere as the Executive Pastry Chef. Her recipes showcase her ease at taking traditional recipes and imparting her own unique style on them, as well as creating new recipes with innovative surprises like her Chocolate Decadence Cake paired with Caramel Ice Cream and Cashew Caramel Popcorn, which I experienced, and savored, at the restaurant. She enjoys experimenting with the art and science of baking, and using local, seasonal fruits and vegetables. When not working in the kitchen dreaming up new recipes, she spends her free time playing with her young son. Chef Taiesha Martin graciously shares her recipes for a Coconut and Pineapple Fantasy, my description, not necessarily hers, of Coconut Tapioca Pudding paired with Pineapple Mojito Sorbet, Sautéed Vanilla Pineapple, and Candied Coconut, which is an expert mastery of flavors and textures. Inspired, I immediately made each of the components in the Luxury Experience test kitchen, and they will be added to my favorite spring and summer recipe repertoire for at-home dinner parties. 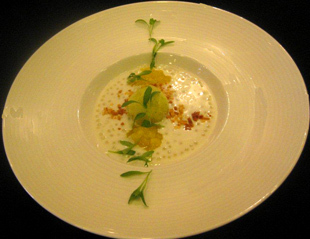 What is especially nice about the Coconut Tapioca Pudding is that unlike most puddings that are egg-based, Chef Martin's recipe does not use eggs, making it perfect for those who have egg allergies. Method: In a medium to large pot heat the milk and sugar until it begins to simmers over medium to high heat. Once the milk simmers, add the tapioca stirring occasionally over low heat until the pearls are translucent (may take up to 45 minutes). Once the pearls are cooked through, remove the pan from the stove, and add the coconut milk. Cool over an ice bath or place in the refrigerator for an hour before serving. Method: Bring sugar and water to a boil and chill over an ice bath or place in the refrigerator until cooled. In a blender combine lime juice, pineapple puree, and herbs, and blend just until the herbs break down into small specks, and then stir in the cooled syrup. Freeze in your ice cream maker according to the manufacturer's instructions. Method: With your pineapple cut into to very small dices (brunoise cut). Place all of the ingredients in a bowl and toss together until the pineapple is well seasoned. Heat a sauté pan until it is hot to the touch before adding the ingredients. Add the mixture and sauté until the pineapple liquid is lightly caramelized. Remove from the heat and let cool in the refrigerator. Toss all ingredients in a bowl and mix until well blended. On a sheet pan lined with parchment, spray the parchment paper with nonstick cooking spray and spread the coconut mixture flat on the pan. Bake until golden brown. Garnish with micro cilantro. 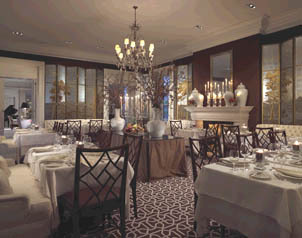 Read about The Supper Room in the Restaurants section. Read the Chefs' Recipes section where Chef Rob Stella graciously shares his savory recipes for Boneless Rack of Lamb with Chickpea Panisse, Piquillo Peppers, and Roasted Eggplant; and Roasted Labelle Farms Foie Gras with Rhubarb Sorbet, Toasted Brioche and Salted Almonds to provide a delectable glimpse into his culinary vision for The Supper Room at Glenmere Mansion. Read more about the Hudson Valley in the Destinations, Hotels and Resorts, Restaurants, and Chefs' Recipes sections.